If, like me, you have an adventurous little monkey running round the house, you’ll know how really very stressful trying to keep them contained and safe can be. Happiness has just turned one and is already a menace on legs. As soon as my back is turned, if he can escape, he will! He never wants to be where I put him, there is always somewhere more enticing. Draws and cupboards can not be left, he has an uncontrollable urge to rummage through everything. Even with a sitting-room filled from floor to ceiling with toys and games galore…no, climbing in the dishwasher or emptying the cupboard under the sink is so much more FUN! My older two boys were never this much of a worry and baby-proofing wasn’t something we had to do much of….but with Happiness, we have to nail it all down and keep every door shut! Dreambaby make all manner of child safety products, everything to make your home a safer place for your child. Founded in 1983, they started life selling their child safety products in Australia and New Zealand. They are now available in over 80 countries including the UK – good for us! As it says – it’s a retractable gate! It says on the box that it’s suitable for doorways, hallways and stairs and can also be used outside on decks, patios and porches. Unlike many gates this one fits the gap you need it to, so from super narrow up to 140cm (that’s nearly twice as wide as your standard doorway) and can be mounted a number of ways so to be flexible. It is made from a sturdy mesh which means it’s quite lightweight and compact. What did mum & dad think? 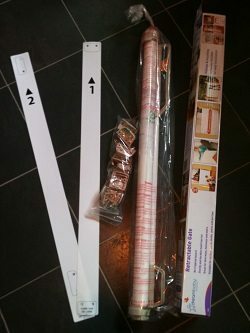 I like the fact it comes with two sets of fixings, so it can easily be moved – perhaps in to the garden.. and that there’s no frame, so nothing to trip over (for me…generally, or for the kids coming down the stairs). Not so keen on the fact it has to be screwed in to the wall, although not unusual for a lot of safety gates. It is an advantage pressure gates have but I guess even they can leave a mark. Our first choice was to put the gate at the bottom of the stairs, something we’ve been meaning to do for a while now as we frequently find an escaped Happiness perched half way up there. Unfortunately our banister comes down too low and got in the way, which was annoying but not the gates fault. Plan B – top of the stairs. For the last few years we’ve had a no-trip wooden gate up there which is fine but blocks off the whole landing when open. Having a much neater and compact gate there instead is very appealing. Again, our plan was scuppered as according to the instructions when being fixed at the top of the landing it needs to be positioned 15cm away from the top step. But we don’t have that kind of stair and I can’t think of many landings that would be able to make it work. So all in all, not suitable for the top of the stairs!! We finally decide to replace the pressure gate we’ve had to keep the babies out the kitchen, thinking the new one would be neater and more discreet. The instructions were frustrating, not making it very clear where to start and what to do next (but then again being a man D didn’t really look at them anyway!). It was simple enough to follow the templates provided to screw in the fixings etc and once all the holes were drilled it was all in place quite quickly. Ascetically it’s not particularly pleasing, the plastic being a horrid grey – why not white?? It seems a bit mean not to have plastic covers to cover up the extra holes in some of the parts, leaving it looking unfinished in places. It took Bean, aged 4, just a quick lesson to get the hang of opening & closing the gate, although he gets quite frustrated as he’s not quite capable of pulling smoothly so it doesn’t lock too soon. And Happiness, well…he hates it!! He screams whenever we go to shut it whether he was trying to get out or not. But I guess that’s because he knows he won’t be going anywhere and his plans of escape has been foiled!!! Job done! £69.99 initially seems rather steep for a safety gate, but having a little internet search it would seem it is about average for this kind of thing. By reputation and quality I would have guessed it would be worth the money, but now I’m not really convinced. I don’t understand why gates of this type are so expensive – when I had to choose I discounted retractable ones straight away purely because of the cost. It’s tricky to conclude this as everyone’s house is different. I am a tad frustrated with it as we couldn’t put it where we originally wanted it – it’s not a flexible as it claims. It’s not for us and the geometry of our house. But it does the job, and I have friends who would be after something like this to use in more open plan style houses, or on patios and they would be super chuffed! We were sent the gate for the purposes of review. All opinions are our own.